Amid all the news about hurricane victims and the outpouring of help aimed at the Gulf Coast, Aspen’s elementary and high school students have found a way to keep their charity closer to home. The two schools have “adopted” Mark Twain Elementary School in Colorado Springs and have been busy gathering clothing and toys to send to the 400 or so impoverished students there. Aspen High Principal Charlie Anastas dubbed the effort the Mark Twain Elementary Grant-A-Wish Drive. It came about because Aspen School District Superintendent Diana Sirko, who was a deputy superintendent in Colorado Springs before coming here, got a call recently from officials at Mark Twain Elementary. Aspen High has adopted the clothing list, Anastas said. He said the student senate has spearheaded the effort to sign up volunteers who will take a “wish” written on a slip of paper pegged to a special board in the central office, buy and wrap a gift according to the wish, and return it to the school. “It’s their wish, and we fulfill that wish,” he said. Anastas said there are still some 70 or so wishes on the board; he invited community members as well as school students and staffers to make donations so that gifts can be purchased for all the students involved. At Aspen Elementary, Principal Doreen Goldyn said her students are in charge of buying toys for their adopted friends and that they are doing a bang-up job of it. At Mark Twain Elementary, teachers Jerri Crouse and Joni Hale started a Christmas program for impoverished kids four years ago when Crouse learned that some of the kids in her kindergarten class were not going to have much of a Christmas. Over the years, Hale said, it has grown from a matter of simply collecting gifts to providing a full Christmas dinner to 130 families and several presents for up to 450 kids as of last year. Hale, who teaches first grade, said the school is located in one of Colorado Springs’ more impoverished neighborhoods and has about 600 students, more than 70 percent of whom are enrolled in the free and reduced-price lunch program. 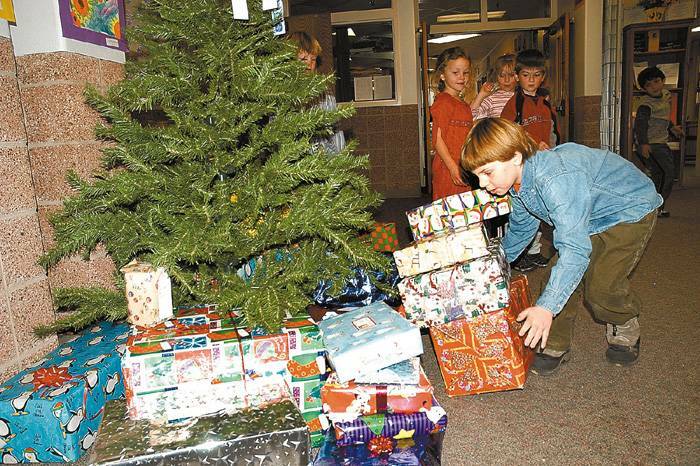 The deadline for the gifts to be purchased, wrapped and deposited in the schools’ offices is Dec. 12.